We all know people who are so smart that their friends call them Einstein. But who ever thought a bird could be that bright? Well, an African Grey parrot from the Knoxville Zoo in Tennessee is called Einstein, and it really lives up to its name. "She loves sunflower seeds, but she really gets excited if she gets a peanut," her trainer Stephanie White said and asked Einstein: "What would you do if you get a peanut?" "Oh, my God, oh, my God, oh, my God!" Einstein exclaimed. The joke at the zoo is that the parrot so smart, it must be girl, White told The Early Show co-anchor Julie Chen. "The boys and the girls look exactly the same," White explained, "You have to have the vets tell you with a blood test. So we just never had her sexed. We didn't think there's any reason to." White has been Einstein's trainer for five years and estimates it can make 200 sounds (including words). The bird knows about 70 on cue and the others it may just do on her own. White says Einstein babbles all day. "Since she lives at the zoo, she does know a lot of animal sounds," White said. And on cue, Einstein made the sounds of a chimpanzee, a tiger, a rooster, a cat, a dog, a penguin and a pig. The 20-year-old parrot also whistled when asked if it thought Julie Chen was beautiful. And said, "Hey, baby," when asked what it would say to a good-looking man. "She gets kind of fresh," White said, and on command, Einstein made the sound of a big kiss. "Her nickname is Stinker," White noted, and showed that Einstein knows that word is associated with a skunk. Not all African Greys are this talented or this smart. But when asked if it thinks it is famous, Einstein said, "Superstar." 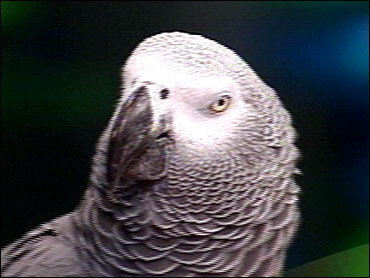 "African Greys naturally like to mimic sounds," White said, "She's pretty exceptional, though. Not all African Greys are like her. She really enjoys mimicking things. If she hears a sound that she likes, she'll start to repeat it over and over. Then we'll put it on cue. She gets a lot of these sounds like us oinking like pigs." To train her to oink like a pig, for example, White said she keeps a pocketful of seeds and as soon as Einstein does the sound she wants her to do, White yells out "good." So Einstein knows right away that she did something that deserves a seed. Then, White will say "pig" as she hands her the seed, so Einstein associates the word with the sound. It takes about a week and a half overall for Einstein to get it down on cue. Einstein also gave its rendition of an evil villain laugh and a Santa Claus laugh. If you stop by the zoo and say hi, Einstein may answer, "Hey, sweetheart." If it doesn't, perhaps you are speaking with Ali, another African Grey. Ali only knows about 7 cues, and that's the bird's maximum capacity. So if you were thinking of getting your own African Grey, consider that you may end up with a parrot like Ali. And know that African Greys live up to be about 50 or 60 years old.